Ingredients: 36 refrigerated won ton wrappers 5 Tbsp. Promise® Buttery Spread 12 ounces assorted mushrooms, coarsely chopped 1 leek, white part only, finely chopped or 1/4 cup finely chopped onion 2 cloves garlic, finely chopped 1/2 cup dry white wine or water 1 tsp. dried rosemary leaves, crushed 1/3 cup finely chopped prosciutto (optional) Directions: Preheat oven to 350°. Spray 36 mini-muffin cups with nonstick cooking spray. 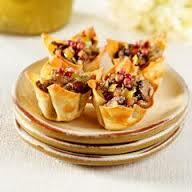 In muffin cups, arrange wonton wrappers, gently pressing onto sides and bottoms. Melt 2 tablespoons Promise® Buttery Spread and brush on wonton wrappers. Bake 5 minutes or until light golden brown. On wire rack; cool completely. In 12-inch skillet, melt remaining 3 tablespoons.